Anyone with new gear, planned camps?......... Anyone? Anything at all.... Come on now. Step forward.... Don't be shy. Lol. 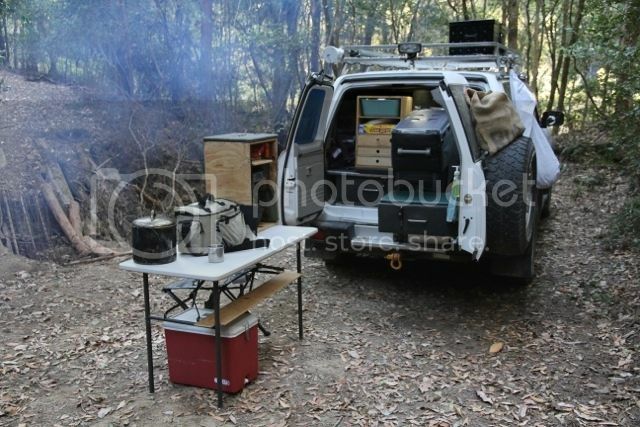 I'm planning on a overnighter up in the Watagans soon. This is my tweaking trip. Clearing the cobwebs out of the gear trip. One thing I'v gotta do is clean out my good old Army issue water Jerrys. Iv notice some crap in the bottom of my cup recently. What's a good way to clean these? Got nothing new, side steps on order. Chuck 1/4 of the bottle into a jerry 1/4 filled with warm water and slosh it around. Then tip it into the other jerry and repeat. Then rinse a lot with fresh water. Cool. thanks Hoyks! and thanks for the link. Thats what I'll use. but not the cold. I like going north because of warmer weather. Not sure what to do North though. If north, any suggestions. Don't want to go to far north. Mackay? Townsville? 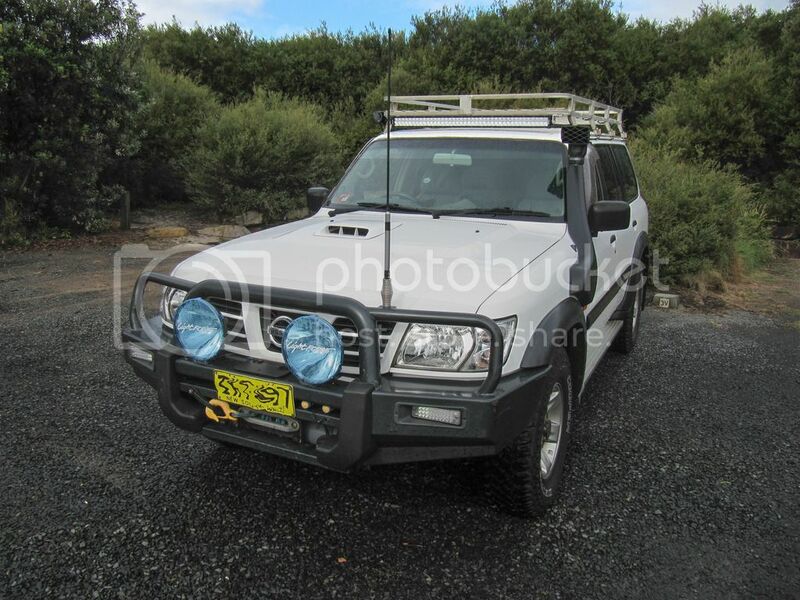 Picking up a new Bullbar for our Delica tomorrow. We LOVE our Delica LWB. Best holiday car we ever had. Not the best 4WD but a great car for us. Sounds Good Big 'D'. Can't help you with suggestions though. I've turned into a Cold freak. Hate the heat these days, actually it's more the humidity, really kills me. I can handle 40°dry heat and comfortably work in it but throw a 28°day with 80% humidity at me and I'm a shot duck. So looking forward to some winter camping in the Barrington Tops this year with the hope of snow and some local Watagan Mt trips. I have to say I've seen some nicely rigged up Delica's over the years. When they're geared and bar'd up they look really good. Any who...... If you have some pics of the Delica I'd be keen to see them!! This is taken around January somewhere in NSW. I really can't remember where. We left home/ Brisbane and drove to Armidale NSW and did spend a few days there. Then to Sydney, Blue Mountains, Watagans, and from there to the coast. So, that photo must have been taken between the Watagans and Crescent head. I haven't made a photo with the Bull bar yet. This was on our first outing. The draws are now painted but the set up hasn't changed much as it really works for us. We have even a toilet for my darling on board. We have replaced the awning. This awning came with the roof bars I bought before we bought the roof rack. The quality of the fabric (very thin kinda plastic) was so poor I wasn't keen to use it any longer. I was able to pick up a good quality damaged awning (same dimensions) and swapped the fabric over. We are very happy with our Bus. We are mobile and can go everywhere. My wife can't walk very far and uses the wheel chair in the photo. A 4WD is our way of bush walking. We see things that we without our 4WD would not be able to see. How much more room do you get in home made draws without runners?? I made my rear draw set up and I'm still tinkering 10 years later. You look as though you may be a fellow Tinker'er as well.... lol. 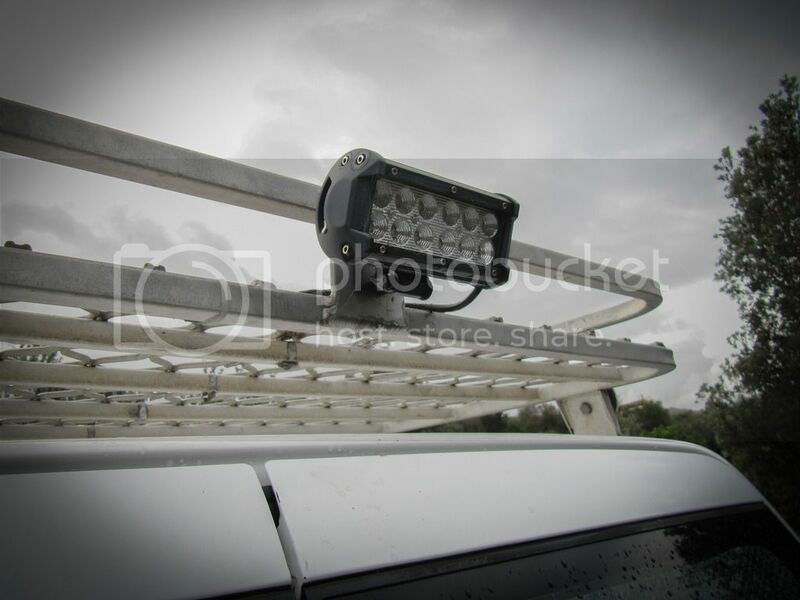 I just today added a 42" CREE LED combo Light Bar tucked up under the front of the Roof Cage. Yet to wire it up. 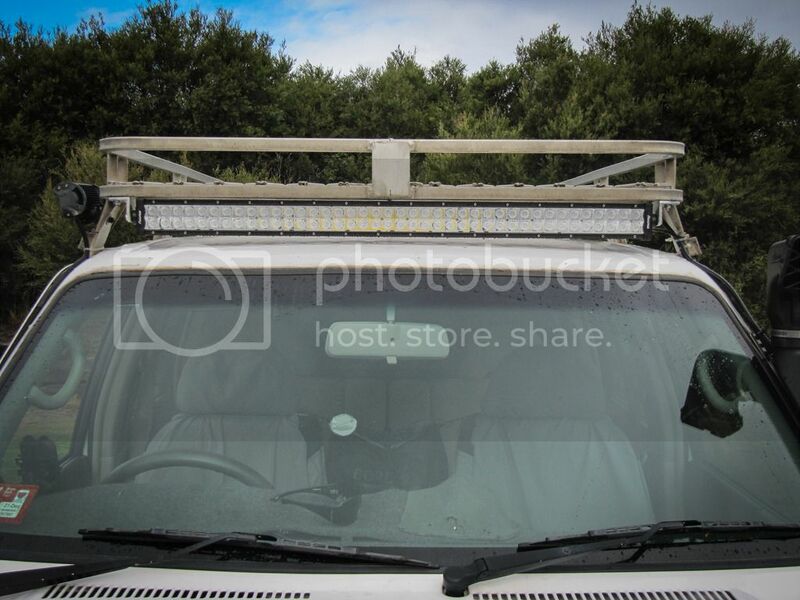 Planning a trip to the Barrington Tops soon and we'll [the wife and I] be driving in at night so the Light Bar should come in handy. 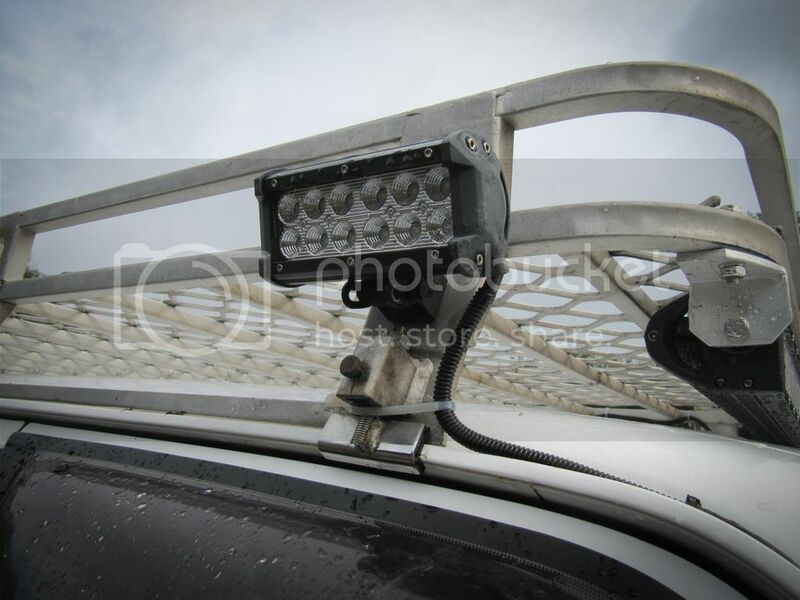 I have a 7" Driver's side and a 7" Reverse CREE light bars. They are bloody bright! Love to see more of your set up. Just dropped the Delica of for a service. We are going away in the coming school holidays. I am keen to go to the snowy Mountains. Still not sure if we should do it or not. Cold is not my main concern it's the wet and struggling getting things dry again. A little late on this thread, but none the less.... Dutchy, if you're around the Brisbane area and want a nice quiet bush camping get away, try Peach Trees Camp Site out in the Jimna forestry. I just spent a few nights there myself and it is awesome.